LOS ANGELES, April 27, 2012 /PRNewswire-USNewswire/ -- NBC4's Emmy Award-winning reporter Kim Baldonado will host the Hispanic Scholarship Fund's (HSF) Second Annual Leaders in Education Awards Luncheon on Tuesday, May 8 at 11:30 a.m. at the JW Marriott Hotel at LA Live in downtown Los Angeles. HSF, the nation's leading provider of college scholarships to outstanding Latinos, and its distinguished board will honor a new generation of Southern California students, parents, teachers, schools and volunteers for being champions for education in their communities. By sharing their stories, HSF hopes to inspire others to follow in their footsteps. "We are pleased to honor these outstanding members of our community in Southern California," said Frank Alvarez, HSF CEO/President. "We have more scholarship recipients and alumni here than in any other part of the country, and education leaders, such as the ones we honor today, help HSF achieve its goal of ensuring that every Latino household across America includes at least one college graduate." "We applaud the Hispanic Scholarship Fund for their dedication and efforts to support and prepare tomorrow's leaders for a successful future," said Tim Hanlon, executive vice president, Wells Fargo Philanthropy Group and HSF board member. "Wells Fargo's partnership with HSF at a national and local level is a valuable investment in our diverse communities and demonstrates Wells Fargo's commitment to quality education for our young people. We look forward to underscoring this commitment with a special announcement at the luncheon." HSF's Board of Directors will be on hand at the event, led by Jim McNamara, HSF Board Chair and founder and Chairman of Panamax Films; Anthony Salcido, vice president, North American Financial Integration of Toyota Motor Sales, USA, Inc.; Tim Hanlon, executive vice president, Wells Fargo Philanthropy Group; actor/comedian Cheech Marin; President of Galan Entertainment, Nely Galan; and Partner at Centinela Capital, Fidel Vargas, are also among our distinguished guests. Also on hand will be Los Angeles Unified School District Board President Monica Garcia and Los Angeles Councilmember Jose Huizar, himself a recipient of an HSF scholarship. Councilmember Huizar will present HSF with a Proclamation from the Los Angeles City Council at Council Chambers on Friday, May 4th at 10 a.m.
A mathematician by training and teacher by trade in his native Peru, Eber Quezada traded his vocation to support a better education for his children. Eber moved his family to the U.S. where he got a job as a pool man working 7-days a week to pay for college tuitions, while mentoring his children academically. Because of his sacrifice and dedication, his older daughter is graduating in Business Administration from UC Berkeley, his son is also attending UC Berkeley double majoring in Physics and Mathematics, and his youngest son will start high school next year. Today, Eber runs his own pool service business while going to school with his wife Enma to learn English. Dr. Guzman is the director of community engagement at Los Angeles County High School for the Arts. She strongly supports arts education. She hosts, organizes, and chaperones events completely by herself and during after-school activities. Because LACHSA is a tuition-free public school, she has tirelessly combed L.A. County to spread the word of her high achieving school through every corner of LA County raising the numbers of applicants from 400 to 1100 in only 3 years-times. Dr. Guzman has been honored as the 2011 Mexican American Opportunity Foundations National Woman of the Year and the 2011 Bank of America local hero for her work with emerging artists, for donating performances to the community, for mentoring young musicians and helping underserved high school students with preparing for college interviews and auditions. A South Los Angeles native, Irazema Guerrero teaches at Camino Nuevo Jose Castellanos Elementary where she strives to better the lives for her students through empowerment in education. Her vision is to give her students access by encouraging them to achieve academically, believe college is not only important but attainable, mentoring them through the many challenges they face in their path to college, and involving the parents in the process. Irazema also mentors other teachers at her school site, and through professional development in the community. A Psychology and Philosophy graduate from UCLA, Irazema is currently working on her Master's thesis about parent engagement in literacy. Woodrow Wilson High School was established in 1937 in East Los Angeles, where 94% of the community is of Hispanic background. Its mission is to empower all students with the skills and knowledge to become independent learners and achieve measurable success. Wilson's student body consists of several academic-career learning communities and two magnet programs that have contributed to a positive jump in student's academic performance. The school's well-articulated focus on student performance has led Wilson to become an AVID National Demonstration Site. Leading HSF supporter Wells Fargo is the Presenting Sponsor of this year's luncheon, and will be presenting the School of the Year Award. HSF's long-time partner and event sponsor The Coca-Cola Company will present the Parent of the Year Award. Long-time National Partner Toyota will present the Student of the Year Award and 37-year HSF partner Anheuser Busch will present the Mentor of the Year Award. Other sponsors include: American Honda Motor Company, Cardenas Markets, Gilbert & Jacki Cisneros, NBC Universal, Nielsen, Pantelion Films, Paradigm Talent Agency, and Southwest Airlines. Founded in 1975, the Hispanic Scholarship Fund believes that the country prospers when all Americans have access to the opportunities a college education can afford. As the nation's leading Hispanic higher education fund, HSF works to address the barriers that keep many Latinos from earning a college degree. To date, HSF has awarded over $360 million in scholarships and has supported a broad range of outreach and education programs to help students and their families navigate collegiate life, from gaining admission and securing financial aid to finding employment after graduation. HSF has created Generation 1st Degree, a program that envisions a future where every Latino household will have at least one college graduate, creating an enduring impact on the college outlook of Latino families nationwide, and strengthening the American economy for generations to come. For more information about the Hispanic Scholarship Fund please visit: www.HSF.net. WatchMojo interviews Cheech and Chong about where they met and working on Up in Smoke. Catalina Film Fest— an annual celebration of film on the only West Coast resort island— today announced the lineup for the 2012 run, May 4-6. The Festival features more than 60 films, industry panels, networking and special events, including yacht and mansion parties. CFF will open with the West Coast premiere of “The Magic of Belle Isle,” starring Morgan Freeman and Virginia Madsen; directed by Rob Reiner. “The Magic of Belle Isle,” tells the story of a wheelchair-bound author who moves to a rural town, where he befriends a single mother and her three kids, who help reignite his passion for writing. CFF’s Opening Night will also feature an awards presentation, with Stan Lee accepting the Ronald Reagan Foundation’s Great Communicator Award. Following the Opening Night awards presentation and screenings, CFF will host its Opening Night Gala with Lee in attendance. West Coast Premiere “Bel Ami” Stars Robert Pattinson, Uma Thurman, Christina Ricci and Kristen Scott Thomas. Directed by Declan Donnellan and Nick Ormerod. A chronicle of a young man’s rise to power in Paris via his manipulation of the city’s most influential and wealthy women. “Broken Kingdom” Stars Daniel Gilles (“Vampire Diaries,” “Saving Hope”), Rachel Leigh Cook (“She’s All That,” “Psych”) and Darren Le Gallo (“Date Night,” “The Matrix Reloaded”)— all scheduled to attend. Two stories weave their way from the harrowing slums of Bogota to the lofty hills of Hollywood. A 14-year-old prostitute and an eccentric American writer forge a peculiar companionship; while a day-care teacher in Los Angeles does everything she can to fight the weight of a tragic secret. “Beauty Culture” This short documentary on the culture of beauty was part of the Annenberg Space for Photography last year and is only screening at Tribeca and Catalina Film Festival. Directed by Lauren Greenfield. World Premiere “Boardwalk Hempire: The Rise and Fall of the Medical Kush Beach Club” Stars Elijah Wood (“Lord of the Rings” “Eternal Sunshine of the Spotless Mind” “Deep Impact”), Stephen Baldwin (“The Usual Suspects” “Born on the Fourth of July”), Tommy Chong (“That ‘70s Show,” “Cheech and Chong,” “Half-Baked”). Chong is slated to attend. The Medical Kush Beach Club was the first and last medical marijuana store ever allowed in Venice Beach, California. This is the five-year history of the Medical Marijuana Dispensary scene in L.A.
“With Great Power: The Stan Lee Story” Directed by Will Hess. Stan Lee will be in attendance. A feature-length documentary on the life and creations of Stan Lee, known for creating compelling stories and fostering imagination through iconic comic books and memorable characters, such as Spider-Man®, The Hulk®, X-Men®, Fantastic Four®, Iron Man® and Thor®. *During CFF, Lee will also participate in “The Anatomy of POW!,” panel (moderated by Chris Gore) with Gill Champion, Co-Founder and CEO of POW! Entertainment. Lee will also introduce a special screening of “The Avengers®” on its opening weekend during the festival and host a VIP brunch with special guests and fans. “The Immigrant” Scott Thomson (“Kids in the Hall,” “The Pacifier”). After being deported back to his native Canada, once-famous comedian Bob London attempts a Hollywood comeback by enlisting human smugglers to sneak him across the Mexico-US border. “Irvine Welsh’s Ecstasy” Stars Adam Sinclair (“Mile High” “Van Wilder 2”)—confirmed to attend. Also starring Kristin Kreuk (“Smallville,” “Eurotrip”), Billy Boyd (“Lord of the Rings”). Directed by Rob Heydon. The film is based on a novel by the writer of Trainspotting. “Confessions of an Eco-Terrorist” (Isla Earth Award) Directed by Peter Brown. Seen through the eyes of activist Peter Brown, the film grants the viewer an intimate look at shipboard life amongst these self-proclaimed animal saviors and sea rebels who shaped the green movement we know and love today. “Double or Nothing” Stars Adam Brody (“The O.C.,” “Jennifer’s Body”). Directed by Nathaniel Krause and written by Neil LaBute. Clark and Becca leave a bar after a night out with friends. They pass a homeless man on the street, and Clark gets an idea. “The Sea is All I Know” Stars Academy AwardÒ-winner Melissa Leo (“The Fighter,” “Frozen River”), Peter Gerety (“Inside Man,” “Changeling”). Directed by Jordan Bayne. When an estranged couple, Sara and Sonny, come to the aid of their dying daughter, the experience sends them spiraling into spiritual crisis, and emotions they do not understand. Show's over. If you missed it, you missed Cheech and Chong live from Connecticut promoting their new app. The app is free because there isn't much to it. The money is from the 'in-app purchases.' They're selling a soundboard and merchandise. Hopefully, it won't become un-updated like their website. Happy 4/20 everyone from your friends at Cheech and Chong Fans Dot Com. FOUNTAIN VALLEY, Calif., Apr 17, 2012 (GlobeNewswire via COMTEX) -- MEDL Mobile, Inc., a leader in mobile app development, announced today that they will be launching the very first "official" Cheech and Chong mobile app, dubbed "The Fatty," set to debut on April 20th at 4:20pm ET. Fans won't want to miss the live stream and chat with Cheech and Chong backstage at their special 4/20 comedy show. Fans will get a behind the scenes look at the making of the app, virtually hang out with and get tips from Cheech and Chong on using "The Fatty." The live stream can be seen at CheechandChong.com. This feature-heavy app is specially designed to engage multiple generations of fans; from the younger generation just now discovering Cheech and Chong's counter-culture comedy to longtime fans that have followed the duo since their start in the early 70's. The Fatty will bring you on an adventure that only Cheech and Chong could have masterminded. Take a ride in their tricked out Chevy Bel Air and discover the features. Cheech and Chong are widely known and still celebrated for their 1970s and 1980s cult classic films and stand-up routines largely based on the hippie, free-love era and their personal love for cannabis. In 2008 they launched the historic reunion tour entitled "Light Up America and Canada" followed up by 2010 and 2011's "Get it Legal Tour" and have confirmed production of a new animated film coming soon. "I've never had so much fun making an app. 'The Fatty' is jam packed with everything a stoner could possibly need," said Dave Swartz, MEDL Mobile co-founder and chief creative officer. "We're bringing something unique, fun, and useful to loyal Cheech and Chong fans everywhere." MEDL Mobile Inc., an early leader in the emerging mobile applications software market, is engaged in the monetization of mobile apps through four primary revenue generating platforms: (i) development of customized apps for third parties to monetize their particular intellectual property, persona or brand, (ii) incubation of apps in partnership with third parties and from a library of more than 85,000 original apps concept submissions, (iii) sale of advertising and sponsorship opportunities directly to brands and (iv) acquisition of apps from other developers and use of a proprietary application programming interface, or API, to make Apps recommendations for our user base. Successful beyond their wildest dreams, the iconic comedy duo Cheech and Chong defined an era with their hilariously irreverent, satirical, counter-culture, no-holds-barred comedy routines. Cheech Marin and Tommy Chong's phenomenal success began on the stand-up comedy circuit which led to nine hit comedy albums and eight hit films, breaking box office records, shattering comedy album sales, garnering multiple Grammy nominations and mesmerizing fans for more than a decade. With nine albums released from 1972 through 1985, Cheech and Chong were nominated for four Grammy Awards, winning the Grammy Award for Best Comedy Album with their third album, Los Cochinos, released in 1973. Big Bambu, their second album, was the biggest selling comedy record of all time in 1972 and remained so for many years. Their stunningly successful comedy streak transitioned to film in 1978 with their first movie, "Up In Smoke," the highest grossing comedy of 1978, topping $100 million at the box office. Cheech and Chong co-wrote and starred in a total of eight feature films together, all directed by Chong. For more information about Cheech and Chong visit http://cheechandchong.com . SOURCE: MEDL Mobile Holdings Inc.
GREER, SC (FOX Carolina) - Organizers announced Tuesday morning the celebrities scheduled to participate in the 12th Annual BMW Charity Pro-Am. The celebrities included Cheech Marin, Anthony Anderson, Gary Valentine, Dean Felber, Kevin Sorbo, Greg Kinnear and Javier Colon. The golf tournament pairs celebrities each year with Nationwide Tour pros. The BMW Charity Pro-Am will be played at the Thornblade Club, The Carolina Country Club and the Greenville Country Club's Chanticleer course from May 17 to May 20. Organizers said the tournament has given $8.6 million to 150 charities over the last 11 years. Cheech and Chong's Animated Movie was supposed to be released last summer. Yet, without explanation, it never happened. 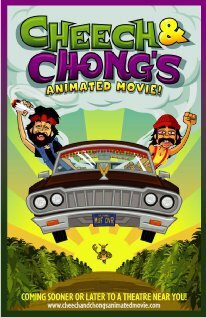 In a recent interview, Tommy Chong says the film was completed, but then the animation studio decided it needed more current songs. He and Cheech recorded 5-6 more songs. It should be released this summer. The animation studio wants to sell it to a big film studio and have a major release. They don't have an official name for the film yet. Good Times Restaurants Inc. (Nasdaq: GTIM - News) today announced that same store sales for March increased 7.9% on top of last year’s 8.6% increase and same store sales increased 7.3% the for its second fiscal quarter ended March 31. March’s increase was the twentieth consecutive month of same store sales increases for the Company. The exterior reimaging follows a systemwide implementation of new menu boards and includes new sign faces, exterior finishes including stacked stone, a new fascia band design, new point of purchase graphics, a new paint scheme and patio enhancements. Good Times is a regional chain of quick service restaurants located primarily in Colorado providing a menu of high quality all natural hamburgers, 100% breast of chicken sandwiches, fresh frozen custard, fresh squeezed lemonades and other unique offerings. Good Times currently operates and franchises 43 restaurants. This press release contains forward looking statements within the meaning of federal securities laws. The words “intend,” “may,” “believe,” “will,” “should,” “anticipate,” “expect,” “seek” and similar expressions are intended to identify forward looking statements. These statements involve known and unknown risks, which may cause Good Times’ actual results to differ materially from results expressed or implied by the forward looking statements. These risks include such factors as the uncertain nature of current restaurant development plans and the ability to implement those plans,delays in developing and opening new restaurants because of weather, local permitting or other reasons, increased competition, cost increases or shortages in raw food products, and other matters discussed under the “Risk Factors” section of Good Times’ Annual Report on Form 10-K for the fiscal year ended September 30, 2011 filed with the SEC. Although Good Times may from time to time voluntarily update its forward looking statements, it disclaims any commitment to do so except as required by securities laws. The Cheech & Chong: Get It Legal tour is coming to the Wind Creek's casino in Atmore, Alabama. Tickets will be available soon via the ticketmaster link above. Lurssen Mastering just completed work on the latest "Cheech And Chong Animated Movie." It's a couple years late, but the film is finally being released this summer.